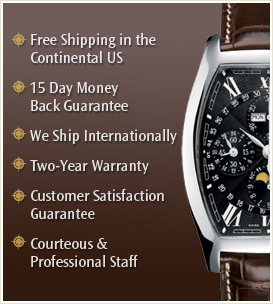 Thank you for visiting WristClocks.com, an exclusive Internet-based shopping experience for the distinguished guest looking for the finest luxury watches available. We are proud to feature Longines and Concord watches, as well as Baume and Mercier. We also showcase Movado watches (we offer Movado timepieces for ladies and gentlemen) and other superlative discount luxury watches, such as Gevril GV2 watches and Ebel watches. You will be thoroughly pleased with the Chopard variety of women's gold watches in our vast selection, especially the Longines Prestige series. Our men's gold watches and men's diamond watches are elegant, but they merely set the stage for some of the most exquisite ladies' gold and diamond watches ever created. Enter and behold our large selection of jewelry watches for ladies, including Concord and Geneve watches... gold and diamond watches that add sophisticated fire and brilliance to timekeeping. Discover also our elegant timepiece creations from Ulysse Nardin, Patek Philippe, Vacheron Constantin and Maurice Lacroix, to name a few. With an unparalleled selection ranging from Movado watches and Longines creations to Geneve watches and timepieces from Baume and Mercier, we are certain to have precisely the perfect timepiece that will handily express your good taste.